Filled with useful information and illustrated with more than 800 images and 180 maps, The Joy of Bird Feeding is the essential guide for anyone who loves to feed the birds. 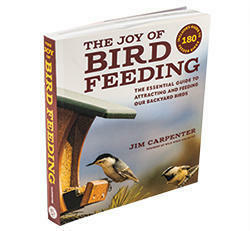 In this book, Jim Carpenter, founder and president of Wild Birds Unlimited, shares a lifetime of bird feeding passion and experience, answers common hobby problems and provides fun bird feeding activities to share with family and friends. Stop by our store to get your copy!